JTK Hana should be coming along at some point in the future as well. Great work! I'm glad you're back to designing key sets, Valla, this looks lovely as do all of your previous ones. Is the row 4 1u Fn missing or is it intended that we use the novelties for that? Edit: maybe one of those row 4 'end' was supposed to be fn? Thank you! That's great to hear and some good motivation to keep going. Good point. I'll replace two of the novelties with 1u Fn's. I'm not really asking that it be changed, just wondering if that's what those 1u novelties were for. 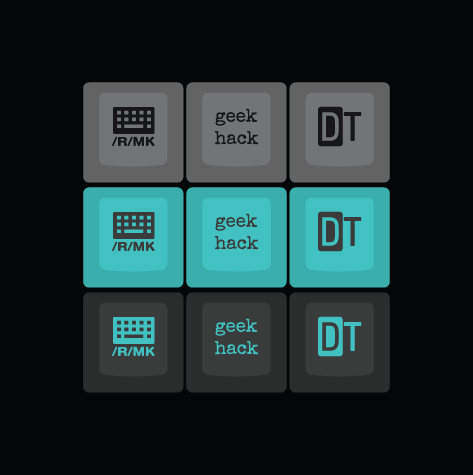 Looks like the GMK Sky Dolch, but with novelties. 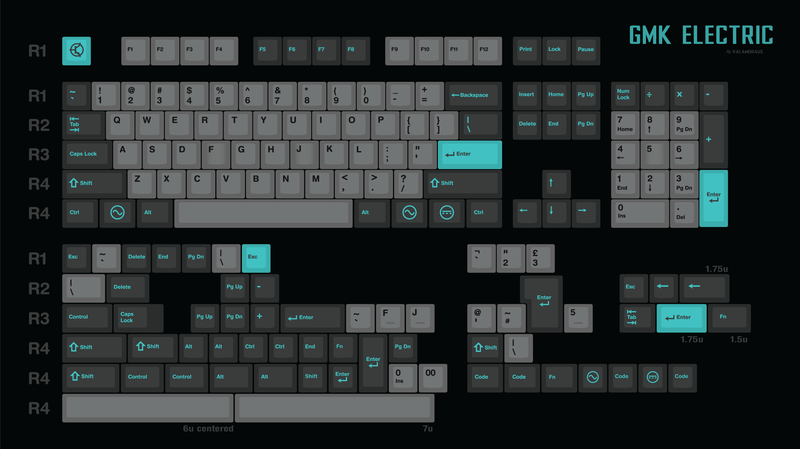 Edit: I know it would make it seem even more like the Sky Dolch, but the legends not being blue/cyan as well makes it seem less "Electric" to me. Yes, that was the intention, but I still think it would be better to just have 1 of each novelty for those who don't want to use them. Why not just replace one of the two R4 End's? Meh. I love black legends, they make the set a bit different (in the best way). Also: people are really crazy about colorway and copying, and this is far enough off that I don't see a big issue. We all have to calm down about colorway, there are only so many ways to put together the same colors. Yeah, it is kind of disappointing that this colorway isn't as unique anymore with Lightcycle and Sky Dolch around. I'm up to suggestions for new color changes though! He renamed the set to Electro, so its all good! Oops, that was probably just a mistake. Thanks for letting me know. nice I m interested in. Yeah, it's fine that's why I suggested it to be more cyan, but whatever works for the designer. I guess you could always mix the two sets. Tbh, even though I never decided to do it, I've thought about "Tron: Legacy" the movie colors. Maybe some darker blacks on this set? 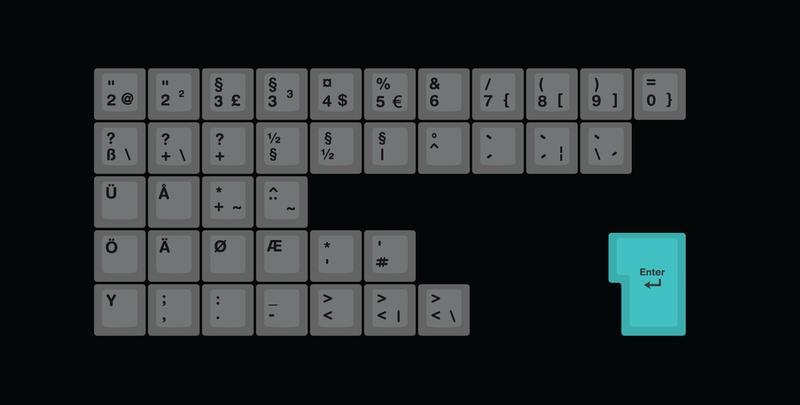 I think this looks way better than Sky Dolch, that set never really appealed to me personally and the black legends add to the contrast here which makes it look quite unique despite the modifiers - I'd like to see the original colours be kept but I understand if you want to veer from the SD/Lightcycle similarities. PS: can confirm GMK Hana would be more than welcome. Is that a framed set of Hana? What are the caps mounted on? Totally agree about the contrast. Great taste in selecting the colors for the set and sensible choices for layouts covered. My budget is basically empty for the year; but, I would make an exception if this reaches MoQ for sure. I like your framed Hana, lol. Looks good. Indeed. 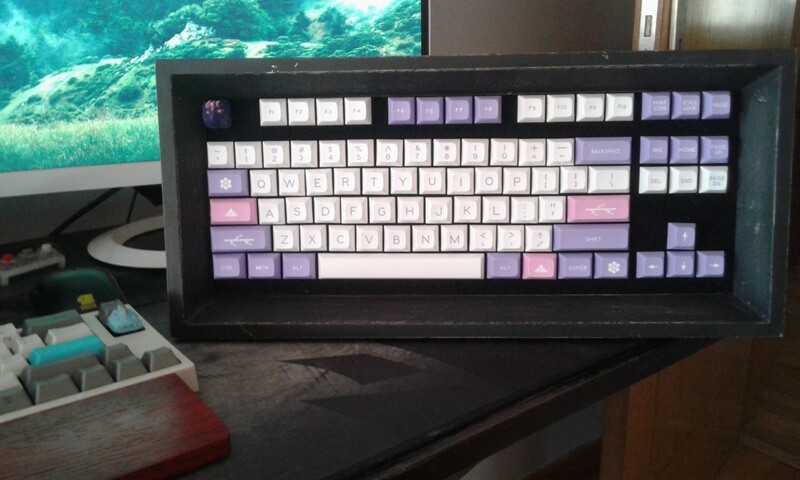 It was an artisan frame I got off of Massdrop, I wasn't sure how gimmicky it was so I only bought one but if they come around again I'll definitely get a few more - they look and feel very nice, the mounts are just plastic (3D printed) MX stems with velcro or a velcro-like material which the bottom of the frame is also covered with. Haha thanks, it's a little crooked because it takes forever to adjust the plastic stems properly but it does pay off in my opinion, I'm happy with the way it looks and Hana is surely deserving of it. 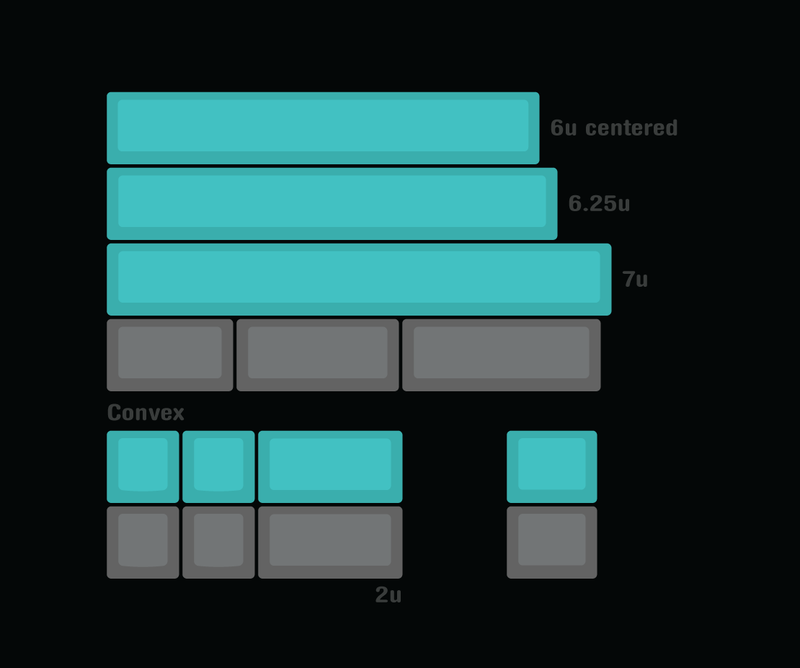 Just an optimization suggestion, most key sets don't include the mod colored |\ key anymore. I can only speak for myself but the way I see it people who go for symmetry only use the mod colored `~ key and those who go for key function accuracy use the alpha color for both |\ and `~. It's late. I meant R2. This set is going to be awesome! Thanks! I'm going to try messing with some stuff and see if it looks better as well. Good suggestion, I'll do that and see if anyone complains. Wow this set looks awesome! Keep up the good work. I would pick this up for sure! 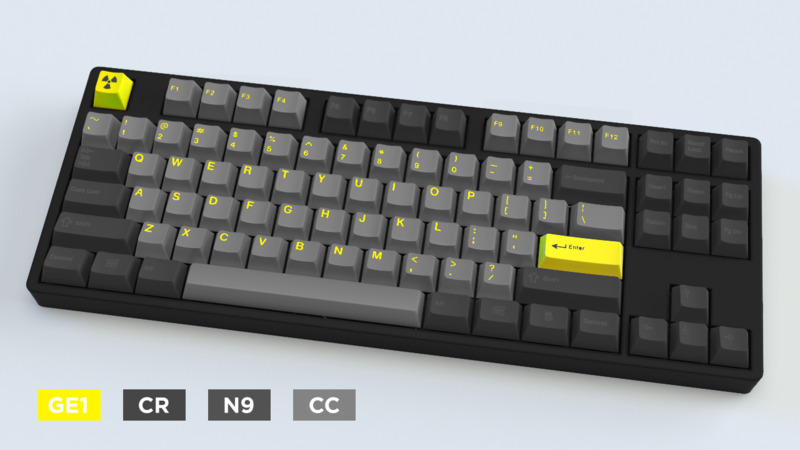 I was originally lurking on discussions around the SA set, but seeing this/thinking about it more, I really like the idea of this running as a GMK set I agree with other comments that color-wise this is quite Sky Dolch-esque (at least for the mods), but the grey/black alphas and novelties do make it a very distinct set IMO. Question: Is UN6037 the same as TU2? GMK Hana would be amazing. I like GMK Electric as well though. I pay attention to details! This looks really good. What does it look like if the modifiers and accent keys have the same colors on their legends? Said it on Reddit but will say it here too. Icon mods seem right for electric. Really hits home with a schematic or board layout. Hope to see an icon mod set, just like Yuri (controls alts and the whole lot of them), if text Mods are final for base kit. In response to a suggestion, I made a child deal for Hatsune Miku. Turns out I had most of the colors already, lol. Thoughts? The set is great; but the only key that could make this set impossible to pass for me is an R3 `~ key to cover a modern ANSI XT layout with an ISO Enter. I know it is a very special key, but being just one it could be fitted with very low impact on the cost for the set. I know there are some users that may take advantage of such layout. Haha. I meant the same color as alphanumerics. 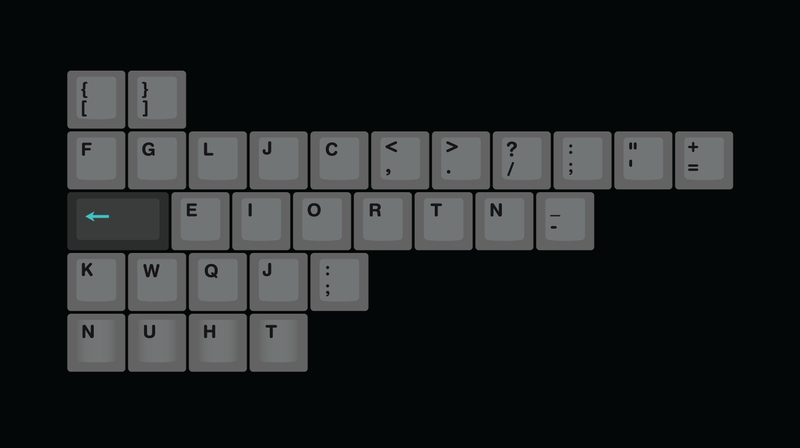 Like a dark legend version of Dolch, but with accent keys. Not a big fan of mixing different legend colors. Makes it hard to read. Wouldn't that make the modifiers blanks? May I propose to tweak the alpha legends with N9, a bit more concordant. Anyway, I love the SA Electric and this GMK. Really hope this set doesn't end up with icon modifiers. Also think it would be better if the side print on pause and print screen wasn't cyan (UN6037) like the top print. Maybe CR and 2B, similar to how Classic Beige has different shades. Would spice things up. 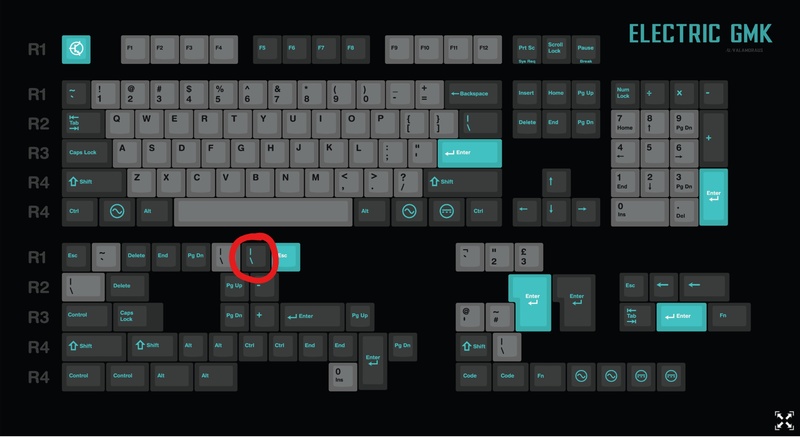 If someone wants to run a GMK stealth set, then I'm all for it, but I wouldn't have any interest at all in a low contrast modifiers with teal accents. The modifiers would be invisible while the alphas wouldn't. Just doesn't seem very electric to me and doesn't work with my aesthetics. I'd much prefer low contrast alphas and high contrast mods. Either way what you are suggesting isn't a minor change, it's a fundamentally different set. You may be right about the low contrast, but I was curious to see what it would look like in renders. I think the cyan/white combination has the same issue you mention. Keys with that combination become unreadable in this set if they also have a small font, like Enter. The side print on pause and print screen definitely shouldn't be cyan. It defeats the purpose to have the same color if you want to use cyan legends on modifiers to make this set pop with color contrast. By placing two equally visually heavy texts right next to each other, they both dissapear. Having them black or light gray would highlight the legend text. The white on cyan part is the one part I don't like. I mentioned it on the Reddit IC, so I never bothered to say it here. It's eye melting and doesn't fit the rest. I also agree the split colors on the side print keys would look nice, just don't forget those would be partially printed not 100% double shot. Doesn't really matter for side print of course. But something to consider. Also, part of the issue is just that cyan is an extremely vibrant color on displays. Don't forget there are lots of white on cyan keys for things like cymk or the gmk cyan set that aren't nearly so vibrant and eye melting. Part of the issue is just that it IS a render/mockup. I feel like this is a set that would likely look more pleasant in real life than any render. Very cool that we ended up agreeing! Page created in 0.174 seconds with 72 queries.